At present Gmail is very important to us, whether it is to use an Android phone or to watch a video on YouTube. In order to use Android phone, you have to login to the Gmail account, for which a Gmail ID is required, or even for office related work, Gmail is also very important. To create a new account on Gmail, phone numbers are required. Today, we are telling you through this article how you can create a Gmail account without phone number. First go to your phone’s settings. Tap on accounts and sync there. You will now have a list of those accounts that you have signed up for. You have to click on Add Account at the bottom. After this you will have several options to create a new account. You can click on Google here. After clicking on Google you will have an option that will ask you to sign your Gmail account. Since you have to create a new account, you have to click Create Account at the bottom left. After clicking, you will see a new page named Create Your Gmail Account. In this you have to fill a few details. Write your first name, last name here. After this click on Next, you will be asked for date of birth and gender. Fill these details and click on Next at the bottom. After that you create an address that you want to keep. You can create the ID you want, provided no other user has created an ID from that address. Then click on Next. After clicking Next, enter your desired password. The password is such that it is not easy and that number, letter and sign are all found. This is the most important job. We are making a Gmail account without phone number. Google will ask you phone number on the new page. If you want you can enter your phone number and click Yes, I’m in. If you do not want Gmail to send messages to your phone, then leave the number placed blank and click on the left side below. After doing so much, the page written in Google’s Terms and Conditions will open before you. Read them carefully and click on I Agree at the bottom right. congratulation! Your new Gmail account has been created. Finally Google will thank you for your new account. 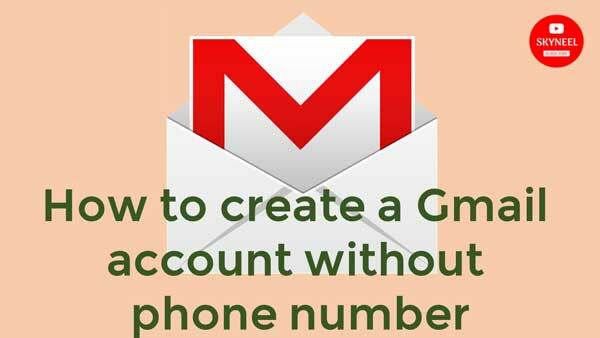 In this article, we told you about create a Gmail account without phone number. If you liked this article, you can also like our Facebook page and also subscribe to our YouTube channel. If you have any problems related to this article, you can tell us by commenting.